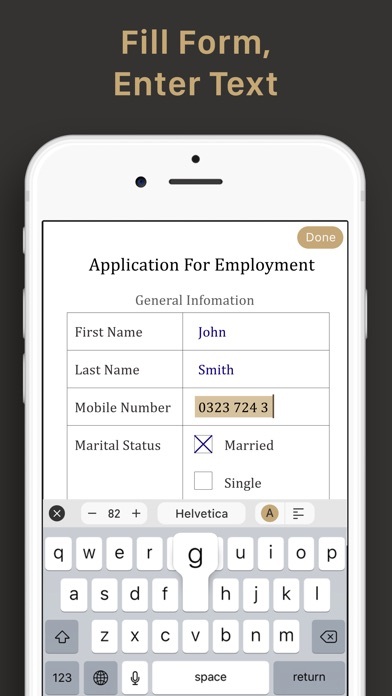 Scan documents to produce sharp images, draw lines, enter texts, fill forms, and sign. 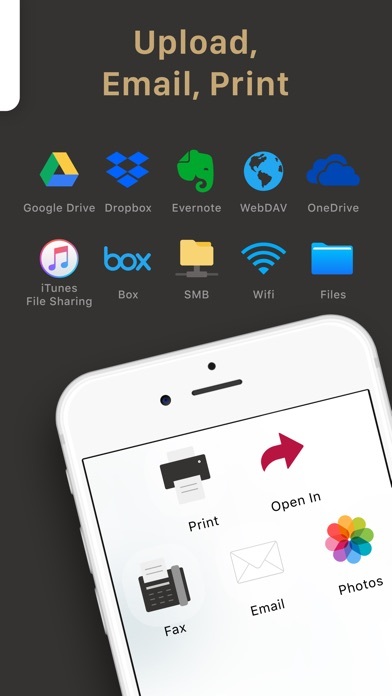 Share as PDF / JPEG by email, iTunes / WiFi file sharing, cloud storages, SMB, WebDAV, and FAX. 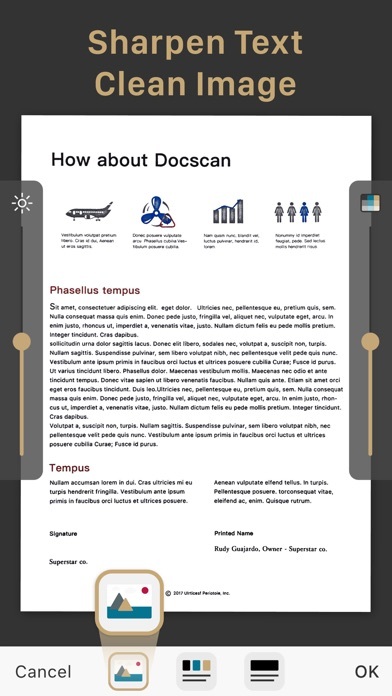 DocScan lets you instantly scan multi-pages document and send out when there is no scanner nearby. 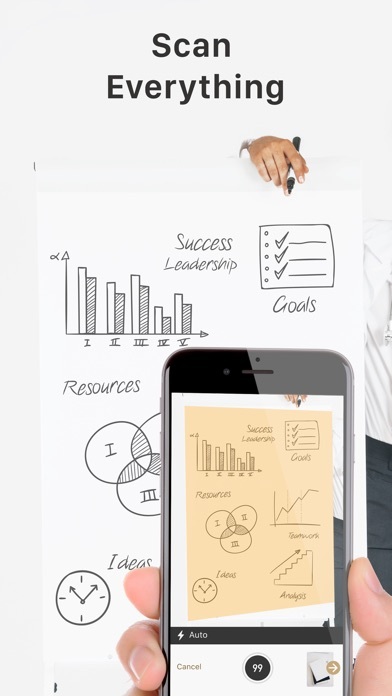 By having it, you can scan not only documents in sight, but also whiteboards, receipts, business cards, posters, coupons, books ...etc. It can fast auto-detect document edges from a picture, correct perspective distortion, remove shadows and brighten it up to produce a clear and sharp document, especially useful in a Low-Light environment. 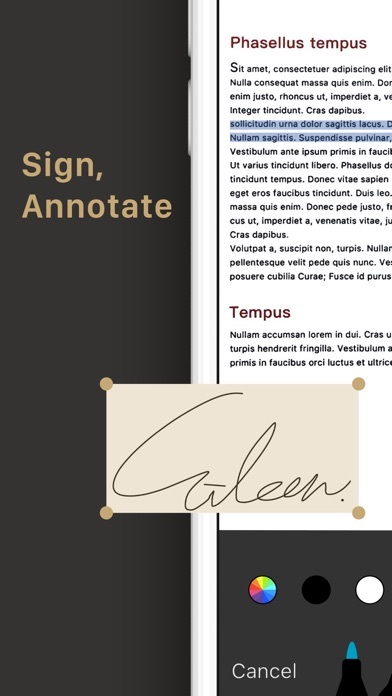 You can enter texts to fill forms, draw lines, annotate, or sign on the scanned image anytime. When you have a long list of documents, it is easy to search documents by name and use folders for organizing documents: create, delete, rename, and move documents between folders. You can also use a ​password to protect documents in a folder from unauthorized view. 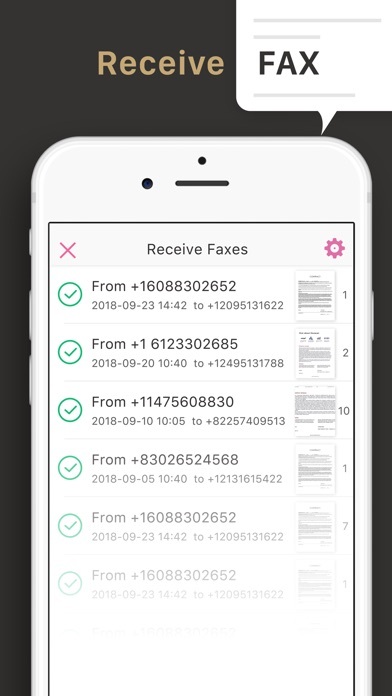 In-app fax sending and receiving is convenient especially when you are out of office or have no fax machine at all. You will receive a push notification when a fax is sent or received successfully or failed for what reason. Each PDF file can be accessed directly from iTunes file sharing or WiFi file sharing. 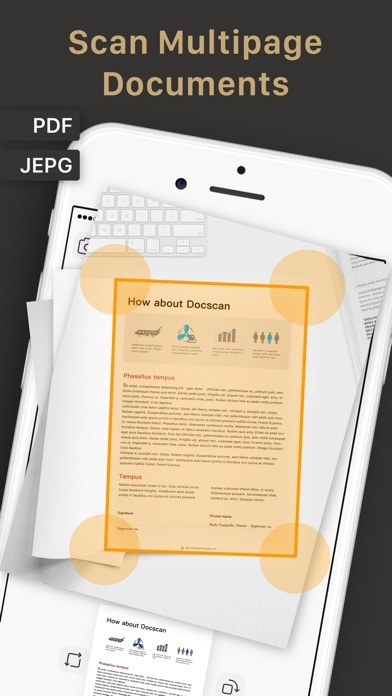 You can also email documents out as PDF or JPEG files. Other ways to export documents: - Fax documents to over 100 countries instantly (cost calculated by the number of pages and recipient country and paid via in-app purchase). - Print documents via AirPrint. - Save documents to Photo Albums. - "Open In" Other Apps, i.e. iBooks, Kindle, …etc. More options to export documents in Pro version: - Support upload to iCloud Drive. - Support export to Dropbox. - Support export to Evernote. - Support export to Box. - Support export to OneDrive. - Support export to Google Drive with OCR (Optical Character Recognition) option. - Support export to SMB. - Support export to WebDAV Server. Import Files: - Import JPEG from other apps as image source to crop, perspective correction, and image enhancement. 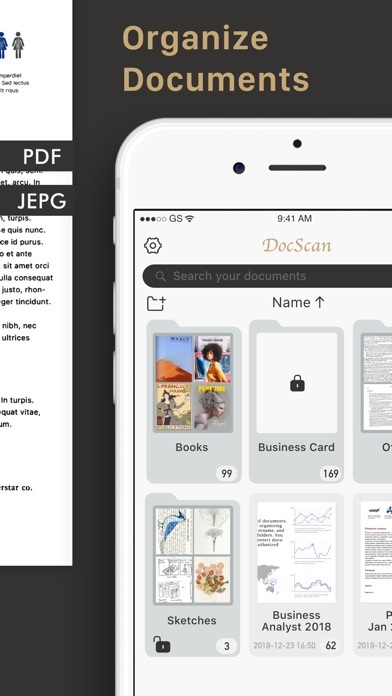 - Import PDF from other apps as scanned pages. Backup and Restore documents: (paid function via in-app purchase) - Backup your documents safely to Mac / PC. Whenever you buy a new phone or lose access to your old one, you will still be able to restore them. - Restore deleted documents manually. It is very useful especially when you accidentally delete important documents. - Restore to any date like a time machine. You can keep multiple backups on different dates. 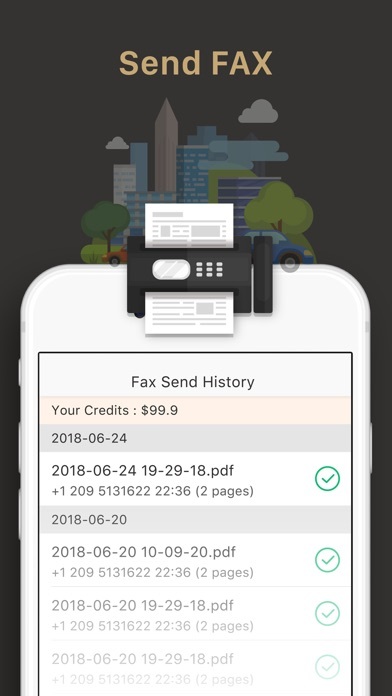 Receive faxes: (non-auto-renew subscription) Support dozens of countries (we kept adding more) for users to subscribe a fax number for receiving faxes. 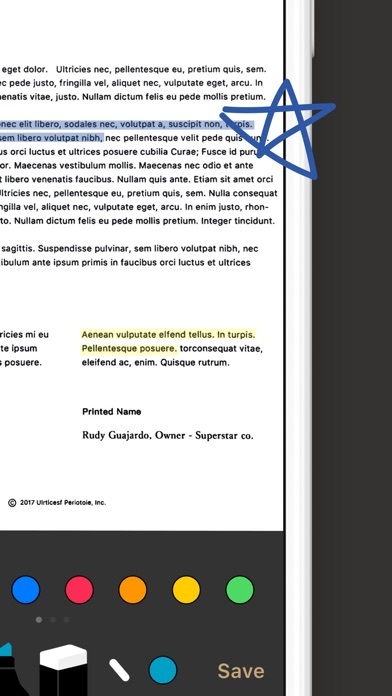 Tip: For best edge detection, please place your documents in high contrast to the background, i.e. put your white paper on a dark table. Your feedbacks are very important to us. Please contact DocScan customer service at [email protected] for resolving problems before submitting feedback in app store. Most problems can be solved easily, but we cannot help you solve problems from the comments. New update makes it terrible and useless. This app was my favorite but now it’s absolutely worst app. I’m not recommending to anyone. - autor:R16681668 - title:Terrible & Useless. Worst App!! !